Internationally renowned stroke clinical researcher, Conjoint Professor Chris Levi is on a medical mission: "Cure more, improve more, harm less". Working on more than eight ground-breaking research projects improving stroke treatment options for patients, Professor Levi is on target to meet his goal, launching what he has described as "the most important acute stroke trial globally". A clot-busting drug, Tenecteplase (TNK) will be trialled at 50 major hospitals around the world. Its potential to cure stroke in some patients has earned TNK the nickname 'The New Kid' on the stroke block. Professor Levi and fellow University of Newcastle researcher Professor Mark Parsons, are the principal investigators on this global acute stroke trial. "TNK is a clot-dissolving drug developed by industry and derived from a naturally occurring protein from the blood vessel wall. The trial will test TNK against the current standard clot-busting drug Alteplase," he said. "Alteplase is good if it works. However, we need better, more effective and safer treatments. Alteplase carries a small, but significant, risk of bleeding and only dissolves the clot in 30-40% of cases. TNK in Phase 2 Trial looks considerably better. We saw patients affected by stroke making almost miraculous recoveries on TNK." Published in the prestigious New England Journal of Medicine, findings from Phase 2 Trial showed that two-thirds of patients treated with TNK displayed major improvement within 24 hours, and 72 per cent showed excellent recovery within three months after their stroke. The TNK Phase 3 Trial begins in Australia and New Zealand in February 2014 and in Europe and Asia in mid-2014. Following his arrival at the University of Newcastle in 1999 to establish the Hunter Medical Research Institute (HMRI) Stroke Research Group, Professor Levi led the group to its current position, recognised globally as one of the leading teams for stroke research in imaging, clinical trials, health systems research and stroke genetics. "Ten thousand people die from stroke each year in Australia. A quarter of those people are aged under 55," Professor Levi said. "Death is one thing, disability is another. With 20,000 people left disabled by stroke in Australia, it's a major problem and the number one cause of disability. It is truly sad to see the impact of stroke on the patients and their families and communities. "Frustration has been my driver. As a clinician, not being able to do enough for my patients or knowing that our health systems could be better is what drives me in research. The problem stares me in the face every day. " Part of a team of researchers from the University of Newcastle credited with making a major genetic discovery in stroke, Professor Levi said the future is in tailored medical care. "We're using genetics to unravel the complex biology of the brain and to see if it can give us a clue to pre-determining factors of stroke," Professor Levi said. Published in Nature Genetics in 2012, the discovery of the signal located within a regulatory DNA on Chromosome 6 (6p21.1) is strongly associated with large artery atherosclerotic stroke, which represent one quarter of acute strokes. "We don't know very much about the genetics of stroke as yet. It's a very complex disease genetically, influenced by many genes and environmental factors. Most of these genetic factors are unknown but once we learn enough about them we'll be able to better profile people and advise if they are at risk of stroke." Part of an International Stroke Genetics Consortium, Meta-Stroke, Professor Levi and his team are also collecting samples from patients with acute stroke, investigating genetic factors that could influence responsiveness to clot-busting treatment. "It's not just about whether you will have a stroke, we're also looking at how well you might do after a stroke and what treatment plan might work best for you." "The body's enzyme systems are all under genetic control. Our genes basically set the plan for all of our body function and drugs. Pharmacological agents are influenced in both their efficacy and their safety by our enzyme systems in our body, which are influenced by our genes." 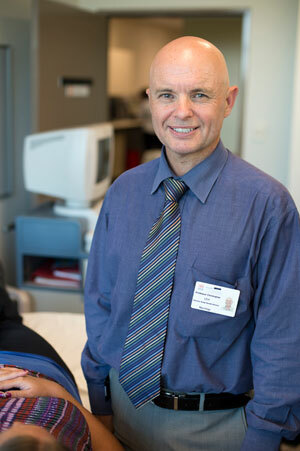 Professor Levi's drive and stellar reputation led him to being selected by the Australian Government to help set the upcoming national standards for treatment for stroke patients, as part of the Australian Commission for Quality and Safety in Health Care Clinical Standards and Indicators Group. "We're moving into an era in stroke medicine where it will be treatment tailored to the patient. Why? It's because every stroke is a bit different, every cause is a little different and it's not a one-size-fits-all-situation," Professor Levi said. "Alteplase has been guideline approved for years, it's been out there on the market, but the proportion of stroke patients that get access to it across the country is only about five per cent. It should be in the order of 20 to 25 per cent. "The Newcastle health system has been re-engineered over the past seven years so that 20 to 30 per cent are receiving clot-busting drugs within the 4.5 hour treatment window. We have achieved this through a number of initiatives." Working with Stroke Awareness, Professor Levi's team has been promoting the FAST: Face, Arms, Speech and Time to call 000 message to raise community awareness of the signs of stroke and the importance of acting quickly to get treatment. At the next stage, a Pre-hospital Acute Stroke Triage (PAST) program was introduced to both metropolitan and rural regions establishing systems to improve pre-hospital care and enhance access to clot-busting drugs. Techniques included bypass of smaller hospitals, helicopter transfer where needed, ambulance guidelines and cutting red tape. The system was introduced in the Hunter Region in 2007 and in 2013 was adopted across the state of New South Wales. Professor Levi is also involved in two health systems studies, one aiming to improve diagnosis and treatment of transient ischaemic attack and minor stroke patients in general practices and hospitals, the other aiming to better implement clot-busting treatment. INSIST, a National Health and Medical Research Council funded comparison study of Trans Ischemic Attacks (TIA) and minor strokes compares treatment of TIA patients from 20 different general practices in the Hunter Region to data collected by Oxford and Auckland Universities. The study assesses how GPs determine if someone is having a stroke, what happens to the patient, how they are looked after and what the long-term outcomes are. The Thrombolysis ImPlementation in Stroke (TIPS) trial is a cluster-randomised trial that is testing strategies to boost the implementation of clot-busting drug treatment. It is testing various strategies including advanced training, education, behaviour change, executive support and more. The TIPS trial is running across 20 hospitals in QLD, NSW and Victoria. The stroke research team have world leading expertise in the application of advanced CT imaging technology to acute stroke diagnosis and treatment. Under the leadership of colleague Prof Mark Parsons, and working as a Toshiba International Luminary Site, the group have pioneered how brain perfusion imaging can better select individual patients for clot-busting treatment by identifying how much brain tissue remains viable at different time points after the onset of stroke. The imaging analysis techniques and their applications are a world-first. Professor Levi is also investigating how combining CT imaging and ultrasound (fusion ultrasound) can be used to determine precisely when a clot has been dissolved and a blocked artery opens. Professor Levi credits the integrated health care system in operation between the local community, John Hunter and Mater Hospitals, HMRI and the University as key to his group's success across many areas of stroke research. The various national, international and local research networks they have built is another reason for their achievements. "Across the University and medical sector, we have people working with the Stroke Research Group in cognitive issues and depression post-stroke, imaging, nutrition, physical activity and more." "By working together in an integrated system, we are making huge advances. The army of people we have pooled together is helping to win the battle against this crippling condition."